I just looked at your "year ago" photo of 'Into the Mist'. It is a beautiful image--very impressionistic. Beautiful picture!! Thanks for sharing. I'm glad you were able to have blogger cooperate today. Here in Northern MN we had a hot, dry summer too, and the leaves seemed to dry out faster, with less color than usual. Of course it's moot now. We had snow today. Gah! Snow!! Keep it in MN please!! 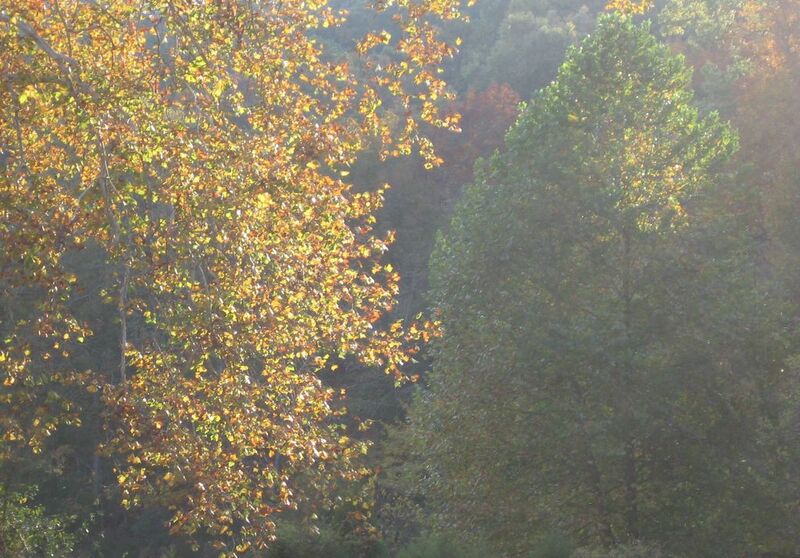 Lovely fall pic, FG Susan. Tell all my little farm friends we say hello from the East coast! And bundle up - it's about to get cold!! We had a hot, dry summer here in Georgia, but I'm not sure leaf color's been affected. Of course, it may be that leaf season's just getting started. The sweet gum trees are already turning red, yellow, and purple. I guess we'll see in another few weeks how the leaf show turns out. First frost should be here Friday night! As always: beautiful photo, FarmGirl. Keep up the good work! We had snow today too! I took a couple pics...maybe that'll get me back in sprit to doing my blog's photo of the day. Fall can't make up its mind here. Some trees are green and red simultaneously (half the tree is resisting the change!). Weird season this year. Thanks for sharing your scenery! This is fun - I click on and you are HERE! We aren't getting much color (well brown IS a color isn't it) here in North Texas - cooler winds blowing now and we are still in severe drought so just praying for trees to all survive. Enjoy seeing your countryside to represent autumn for the rest of us! We finally have "cool" weather in north Texas!!!! I have heard no one complaining of it being 61. It is wonderful. The wind is welcome. Rain "may" be on the way. It is welcome, too! Freezing in Ohio today. The wind is really kicking up. We are expecting snow tomorrow. Stumbled upon your blog, but Im really enjoying it. we had flurries (snow) here today in Barrie, Ontario, Canada. Looks like fall might be over early this year. I think all the blogging problems just mean that it's time to query agents about turning it all into a book! I think it's a sign. Love your Fall header up top! Too cute. Your sheep's eyes up there make me grin every time I visit! Lucky you. We had our first snow in Chicago yesterday. Fall is my favorite season, so it breaks my heart that it's being cut short. But at least I can live vicariously through your pics! Frost here last night! Yikes. I am not ready. I actually like everything about winter except the ice. Cause I'm a klutz, and I fall down. Last year, I slipped on a big patch of black ice on a sidewalk downtown, on the way to work, in the morning before dawn. It was so slippery, that I couldn't get my footing to get up. Kept slipping, and falling again. I was wearing a huge big, long coat, and carrying a bag full of files, and my lunch and stuff. I was like a bug on its back. Once I mentally pictured what I looked like, I started laughing, and couldn't stop. Naturally this did not help with the getting up. Two strangers tried to help me and fell down, too. They both started laughing, and the one guy spilled his take-out coffee, all over the other one, and me. It took us nearly 15 minutes to get all three of us up, and onto safer ground. I walked the 2 more blocks to work covered with ice and coffee, giggling weakly, and headed for the bathroom, to clean up. OK, it was amusing and all that, but I'm just not ready yet. Let's just have a little more autumn, please. Breath-taking; so glad you are posting! !